The super regionals are in the books and now its time for the 2013 College World Series to get underway in Omaha. Eight teams will square off starting with double elimination play, wherein four teams will advance to the best of three games championship series. 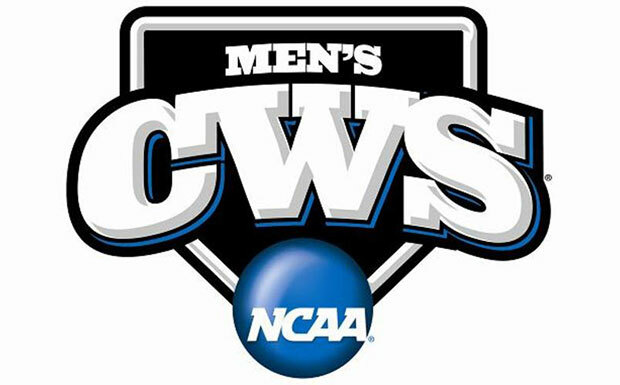 It is there that the 2013 NCAA Championship team will be decided, as a season that began four months ago in February will conclude in what should be an exciting finish to a season of competitive college baseball. 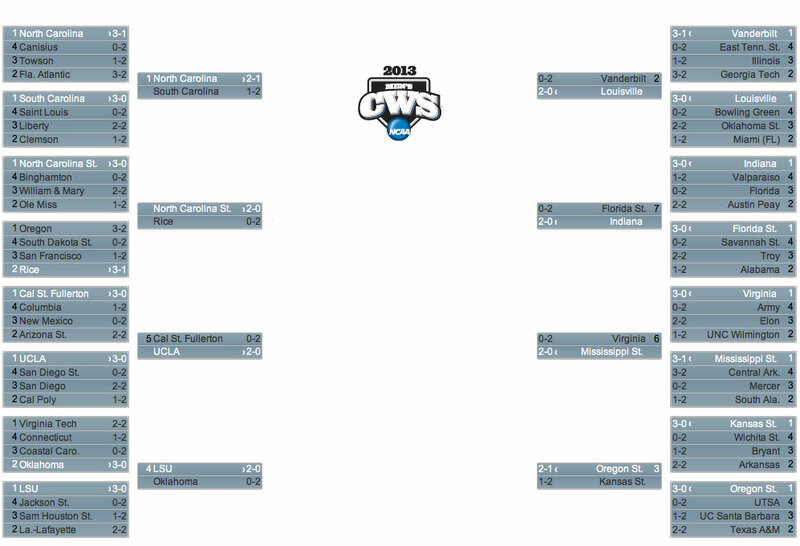 Of ten eight teams that advanced to the CWS, three ousted top ranked teams in the process. Louisville swept No. 2 Vanderbilt, Indiana swept No. 7 Florida State, and UCLA swept No. 5 Cal State Fullerton all with relative ease. Below we have listed the complete schedule of each CWS game to follow. Based on bracket rankings, we have projected when each of the first four match-ups will occur (such projections are provisional and are subject to change). As the final super regionals concluded on Monday and CWS play commences on Saturday, we will be periodically updating this page with previews and scores. Wes Rea came through with a go-ahead two-run double in the eighth inning, propelling the Bulldogs to a 5-4 lead and eventual victory over the Beavers in the College World Series opener. Michael Conforto led the charge for the Beavers with a 4-for-4 performance highlighted by an RBI double in the first inning and an outfield assist, but Oregon State would fall short and will look to stay alive in the losers bracket game on Monday. Despite a strong relief appearance by Cody Eges, the Cardinals offense was absent in the College World Series opener and Louisville will now face Oregon State in Monday’s losers bracket game. Joey DeNato pitched a complete game shutout in a 2-0 rout of Louisville, leading the Hoosiers to their first College World Series win in school history. The Cardinals knocked No. 2 national seed Vanderbilt out of the tournament in the super regional after sweeping their regional tournament. The Cardinals rank second in the nation in steals (150). The Hoosiers’ slugging percentage (.452), which is the best among the eight Omaha qualifiers, and averaged 9.4 runs per game in sweeping their way through regional and super-regional competition. Carlos Rodon was masterful once again for the Wolfpack, delivering a valiant complete-game effort in NC State’s 8-1 victory over the number-one ranked Tar Heels, their first College World Series victory since 1968. North Carolina looked outmatched in all areas on Sunday afternoon, dropping the Day Two opener 8-1 to their in-state rivals. However, a rally in the ninth inning against Rodon may serve as a confidence booster for the Tar Heels as they ready themselves for Tuesday’s losers bracket game. Carlos Rodon leads the country with 170 strikeouts, and his average of 12.93 strikeouts per nine innings. North Carolina State has won 95.6% of the games in which Trea Turner has reached base. The Tar Heels lead the nation with 529 runs scored. Colin Moran leads the nation with 88 RBIs and the Tar Heels with 13 homers and has walked 61 times while striking out in just 22 at-bats. Aaron Nola turned in another strong outing for the Tigers, but critical defensive miscues proved to be the nail in the coffin for LSU down the stretch, as they will face the top ranked North Carolina Tar Heels in Tuseday’s losers bracket game. Adam Plutko did everything that the Bruins could have asked of him, holding one of the strongest lineups in college baseball to one run and cementing an important 2-1 win for the Bruins on Day Two of the College World Series. UCLA is 37-0 when taking the a lead into the eighth inning. UCLA’s five tournament opponents scored 10 runs. Strong performances by Max Gordon and starter Ben Wetzler, along with miscues by the Louisville defense, allowed the Beavers to steamroll past the Cardinals 11-4 and into another elimination game on Wednesday to keep their Omaha dreams alive. Louisville played sloppy in all facets of the game on Monday and became the first team to exit the College World Series, capping off an overall successful season for the Cardinals who posted a final record of 51-13. Behind a strong relief appearance by Chad Girodo that saw the Bulldogs senior southpaw strikeout 10 batters, Mississippi State pulled off a go-ahead comeback in the eighth inning to upend Indiana and move closer to their first NCAA title in school history. Indiana jumped ahead with the early lead, but came up just short against the Bulldogs on Monday evening, and will now have to face the Oregon State Beavers on Wednesday to get a second match-up against the Bulldogs on Friday. Behind a strong start by closer Trent Thornton and a two-run shot by Brian Holberton in the first inning, the Tar Heels ousted a potent LSU Tigers team and will continue on in the postseason towards winning that coveted first NCAA title in ten Omaha appearances. The Tigers were unable to pull it together against either UCLA or North Carolina, coming up just short in both contests and in a season that saw LSU dominate in all aspects of the game. The Wolfpack had no offensive response to UCLA pitching in Tuesday’s game, as they now face elimination from postseason play and will face North Carolina on Thursday to keep their Omaha dreams alive. Nick Vander Tuig pitched a masterful game for the Bruins, holding the hot-hitting NC State lineup to just one run as UCLA moves one step closer to grabbing their first NCAA title in school history. Matt Boyd turned in a masterful performance, shutting down the Indiana lineup in a complete-game shutout and leading the Beavers closer towards the best of three championship round. Aaron Slegers was dominant in his own right on Wednesday, going toe-to-toe with Boyd, but his one run allowed in the fourth would prove to be the nail in the coffin for the Hoosiers who were ousted from their first NCAA Tournament in school history. Hobbs Johnson led the way for the Tar Heels in a must-win game against in-state rival NC State, pitching 8 1/3 scoreless innings en route to a 7-0 rout of the Wolfpack, as North Carolina advances to face UCLA on Friday. Although Carlos Rodon pitched a decent game, the Wolfpack bullpen surrendered five runs and the game to the Tar Heels, as the Wolfpack become the fourth team to exit the College World Series. The Beavers didn’t have an answer to the Bulldogs on Friday, as they were ousted from the College World Series and will have to wait another year to add a third title to the shelf. On a brighter note, the Beavers finished with a higher win total than their 2006 championship year, posting a 52-13 record this season. Hunter Renfroe slugged a three-run home run in the fifth inning, giving the Bulldogs a 4-1 lead, wherein they would never look back. With the victory, the Bulldogs advance to the College World series finals for the first time in school history. Pat Valaika cemented the win for the Bruins with a two-run double in the seventh inning, giving UCLA a 4-0 lead and the eventual victory against North Carolina. With the win, the Bruins advance to the College World Series for the second time in the past four years and will look to grab their first NCAA title in school history. Cody Stubbs and Landon Lassiter each had three hits, but the Tar Heels were unable to pull it off on Friday, becoming the sixth team to be eliminated from Omaha. Despite their elimination, the number-one ranked Tar Heels finished the season with their highest win total in school history, finishing the season with a 59-12 record.